The Health app on iPhone is primarily used to track fitness and activity, and likely much more once the Apple Watch and other sensors connect to the device, but another handy and lesser known feature is called Medical ID. 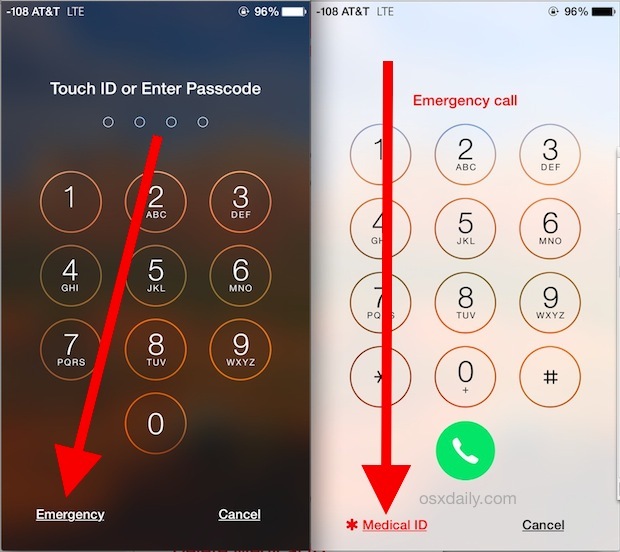 Medical ID can be filled out on your iPhone to show important information about the iPhones owner, and it can be checked on another users iPhone too – assuming they placed appropriate details. Medical ID can show an iPhone owners name, birthdate, medical conditions, medical notes, relatives and partners, emergency contact information, blood type, whether you’re an organ donor or not, weight, height, and other details you want to add as well. Now that Medical ID has been filled out, let’s check it from the Lock Screen to make sure that you’re happy with what’s visible. This is also how you’d check the Medical ID of another iPhone owner, assuming they filled it out. One thing that is missing from Medical ID is a photo identification feature (beyond the avatar, at least). This would be a good feature to add because, in theory, if someone was passed out on the ground and had two iPhones with them, you’d want to be sure the data is for the proper user if you were to act on it. Nonetheless, it’s still likely valid, at least for contact information. Filling out Medical ID is entirely optional, but it’s probably good practice to include at least some basic data, if not for the health reasons then perhaps for helping to return a lost iPhone (Siri is good at that too). Sure there will be some who are concerned about privacy, but for the most part this feature is probably not much different from the little bracelets that some people wear who have a specific health condition that is of note. Whether you use it is up to you, but for health reasons or for helping get a lost phone back to you, it could be very worthwhile. 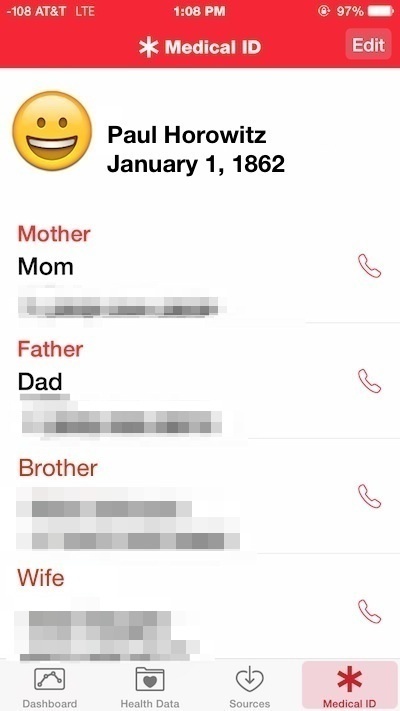 its so dumb you cannot add emergency contact person noway around it or even a copy and paste etc leave a blank emergency contacts apple think again! Murray, enter your emergency contact under “Spouse”. It’s not the best idea but better than nothing. I agree; “Spouse” should read “Emergency Contact”. There should also be a notes panel which could be used, amongst other things, for nationality and passport number in case of emergency when abroad. Under the Emergency Contacts the option at the very bottom of the list is “Emergency”. re comment above…..and OSX giving false information in their daily update. Come on . Up your game. This has to be a reprint of very old information. A related article mentions Steve Jobs “taking a medical leave”. Hasn’t Mr. Jobs been dead for several years? 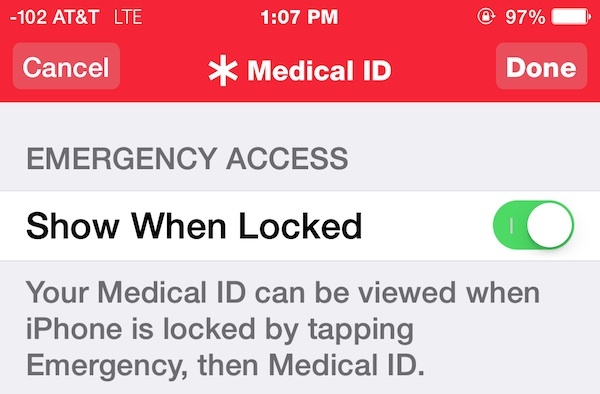 Medical ID is an iPhone feature only available on modern iOS releases, update your iPhone if you don’t see the feature. It’s a new feature. As for SJ, Steve Jobs passed away years ago, it’s unlikely the feature has anything to do with him though it is rumored that Apple Watch health tracking was inspired partially by his experiences being ill.
thanks for making me aware of an overlooked feature. i don’t understand why this site and it’s good tips get so many d-bags commenting and slagging on them. it must just be feral 14 year olds or something. Love this feature! I use med ID , life saver. Is there a fix for the medications section being truncated, when viewed while locked? Thanks. Is there any way to transfer the medical ID between iPhones other than tediously typing it all in again? I have iPhones on mobile accounts in more than one country. My medical history for emergency purposes is quite lengthy. I have created a rather long “Medical ID” file in my iPhone listing all my most significant medical events / procedures / drug lists / emergency contacts etc. I would like to be able to simply export this data to any new medical provider or organization that needs to know this information. However I cannot find any way to export / copy / email / make a PDF / export as a word document etc. I have looked and asked for a few YEARS to Apple how to this – suggested such functionality be added etc. It seems odd that Apple talks a lot about solving the medical data transfer problem, yet leaves the user with NO solution regarding their own data export options with respect to the “Medical ID” file??? Anyone know a solution to this problem?